The Hurst family has a rich sugarbeet heritage beginning long ago with Winfield Hurst. Early in his youth, Winfield worked for a sugarbeet farmer near Woodville, Idaho. Horse drawn implements, hand thinning, and hand harvesting defined this era. Winfield’s farm work continued until he entered church missionary service. After serving a mission, Winfield courted and later married Arvella Thorne on September 12, 1917. Life changed dramatically as Winfield was drafted and entered military service on October 10, 1917 during World War I. Corporal Hurst led 15 fighting men in the trenches of France. Norman recalls tales of his father’s elation as the armistice was signed and the fighting ceased. Following military service, Winfield and Arvella decided to move to northern Montana and homestead 160 acres. Growing sugarbeets for Utah and Idaho Sugar (U&I Sugar) was their mainstay. Settling in Zurich, near the Milk River, proved challenging as there was no electricity and it was most definitely frontier living. Winfield’s skills as a productive sugarbeet farmer surfaced and he was later hired to be a fieldman for U&I Sugar. Norman was born March 26, 1929 and 3 years later his family left Montana to relocate near Declo, Idaho. Norman vaguely recalls his father loading his sugarbeet equipment on a train car and shipping it to Declo. They travelled the dirt roads all the way from Montana, encountering their first paved road near Pocatello. The first night in Declo, Norman and his siblings laid awake staring at an electric lightbulb for their first time. Winfield began farming in Declo during the spring of 1933 where he raised sugarbeets for Amalgamated Sugar along with potatoes, grain, and hay. Norman recalls harvesting sugarbeets with a 1-row, horse-drawn puller. He would follow behind, pick up the beets, cut the tops off with a beet knife and load them onto wagons. They would then be delivered to the Declo receiving station. The beets were emptied onto a piler using a system of pulleys that would lift and dump the side-hinging wagon box. The piler loaded rail cars to be shipped to the old Burley sugarbeet factory. During World War II, Norman recollects German prisoners of war helping with sugarbeet harvest on the Hurst farm. Small acreages were common during this era. Winfield planted 15 acres of furrow irrigated beets with a 4-row, horse-drawn planter and boasted the straightest rows in the county. Those same horses, successfully trained not to step on beets, were used to cultivate and later harvest the crop. Norman and his siblings spent countless hours thinning and weeding sugarbeets. Many times, Norman would ask his father if there would ever be an easier way to control the weeds. Winfield’s reply was someday weed control would be simple and efficient. Norman recalls the transition from horse drawn implements to tractor operated machinery during the late 1940’s on the Hurst farm. Norman left the farm for a time to pursue his education with hopes and dreams of becoming a lawyer. He first attended Albion Normal college for 2 years, leaving for a time to fill church missionary service. Upon returning from his mission, Norman applied to the University of Utah and was accepted to begin his law school education. However, plans were changed when he was drafted into the United States Army. He left for basic training during 1952 but managed to find enough time on leave to marry his sweetheart, Joy Richins. Norman spent his military service as an occupation soldier in post-war Germany, returning home in 1953. Upon his return, Norman found employment with Union Pacific Railroad. Norman and Joy decided it would be best for him to continue his education. He did so and received his Bachelor’s in Education from the newly renamed Utah State University in 1957. While attending college, Norman began renting his first farm and raised sugarbeets. He would farm during the summer and attend school during the winter. In 1960, Norman and Joy bought their first farm near Declo, Idaho and have raised sugarbeets ever since. Norman combined his farming with a career in education. He taught school in Cassia County from 1957 to 1970 whereupon he entered the central office as an administrator. In 1980, Norman became the Superintendent of Schools for Cassia County and served in this position until his retirement in 1993. Norman’s wife Joy also filled a career as an elementary school teacher. Norman and Joy, along with the help of their children, balanced farming, operating a small dairy, church service, and careers as educators for many years. Joy was an integral part of the farm. She could often be found on the tractor preparing seed beds, cultivating beets, swathing hay, and driving truck. Norman’s son Wayne, with a passion for farming, returned home to the family farm in 1980 after filling a church mission and attending Brigham Young University. 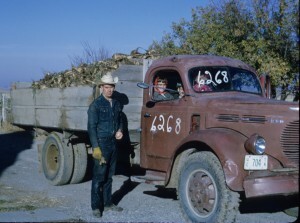 Together, Wayne and Norman raised potatoes, sugarbeets, hay, grain, beans, and corn along with operating their dairy. In 1997, Wayne and Norman bought into the newly formed Snake River Sugar Cooperative and have raised about 160 acres of sugarbeets each year since that time. During Norman and Wayne’s sugarbeet farming career they have witnessed some significant changes to the industry. Norman recalls fondly the advent of mono-germ seed. Prior to this time, beets would grow in clumps of 3 plants and had to be hand thinned to 1 plant, often on his hands and knees. Wayne recalls implementing the first pre-emergence herbicides during the 1980’s. Both Wayne and Norman remember the historic buy-out of the Amalgamated Sugar Company by the Cooperative of farmers of which they were a part. Winfield’s prediction of easier weed control came true during 2008 when Norman and Wayne implemented glyphosate resistant sugarbeets on their farm. They gladly bid farewell to the days of hand weeding fields multiple times throughout the season. Wayne continues a family legacy of farming and raising sugarbeets. Along with his farming enterprise, Wayne served as president of the Idaho Grain Producers Association and later as president of National Association of Wheat Growers. He is currently an officer in the National Wheat Foundation. Norman and Wayne have expressed the importance of the sugarbeet industry to their heritage, both past and current.